Back in November I showed you my daughter's completed new room and mentioned that I would tell you how I did a "cheater" job to reupholster her chair. Well, 6 months later, here you go! The chair was in fairly good shape except for a few spots on the arms. When we chose the red color scheme for her room, I thought this chair would work in there but wanted to jazz it up a bit...it was a bit of a wall flower. I gathered scraps of leftover fabric and played around with which pieces I wanted to use where until I was happy with the layout. I started with the back panel and cut my fabric with a bit extra around the edges. I left probably 8-12" on the sides and bottom, and just about 2" or so along the top edge. I simply folded the top edge and creased it with my fingers, and then applied hot glue under the fold and tucked it right up close under the cording. Believe it or not, hot glue does a really good job of bonding fabric! I left more fabric around the sides and bottom because I was able to just tuck those sections way in towards the back (between the back and the side wing) and they stayed nicely. 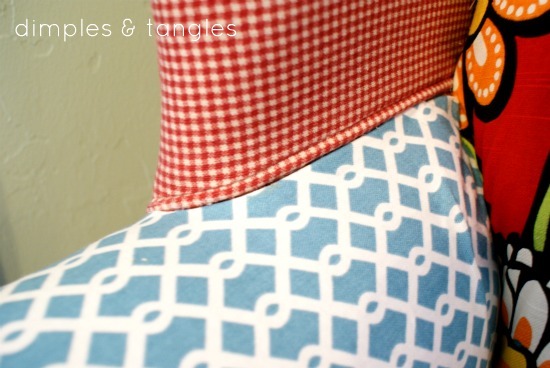 It was helpful to use an old butter knife to force the fabric to slide under some of the tight edges like this one. I didn't want the fabric to pull out when someone sat in the chair, and with the extra bulk I could stuff it way back and it stayed put nicely. To cover the arms, I did the same thing, folding under every side that would show, hot gluing carefully right along each edge, and tucking under cording as close as possible. 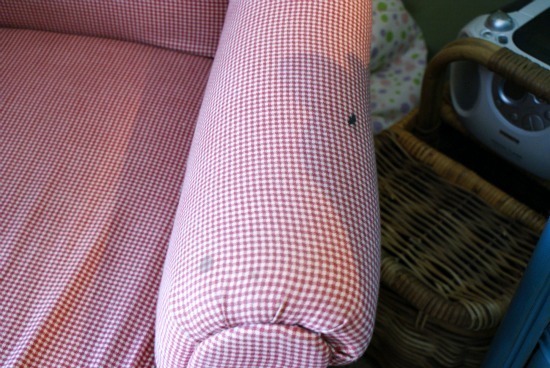 Once I reached the back cushion and bottom seat edge of the arm, I tucked the excess fabric tightly into those crevices. 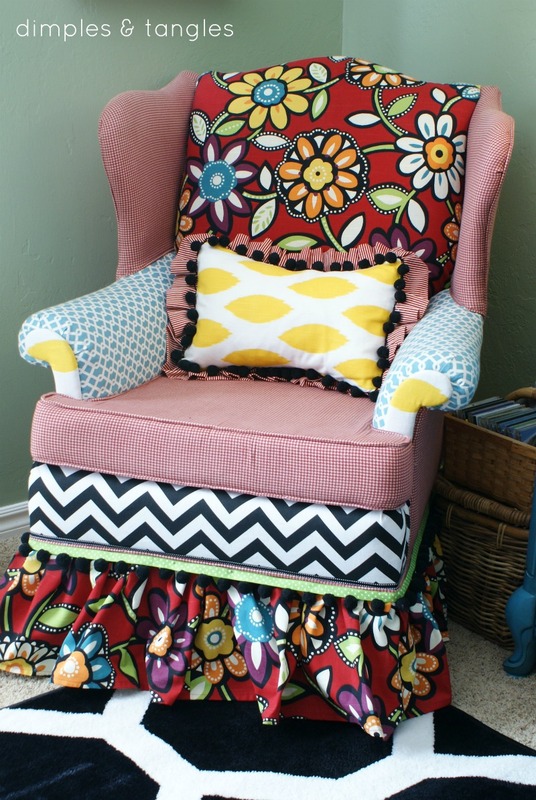 I didn't have a picture of this part, but those yellow pieces that she has her finger on were attached with little upholstery tacks on the underneath side. I pried them off with a screwdriver, but left them attached along their bottom side (so that curved section folded down like a flap). Then I made a clean fold along the bottom edge and wrapped the fabric around to the back and glued along the edges. I folded the "flap" back up and pushed the tacks back into place. The pieces were a bit loose so I went back with more hot glue and pressed on the pieces firmly until it dried. Perfect. Back and arms...everything between the back cushion and side wings and arms and the bottom of the arms is just extra fabric tucked in tightly. So far I've never had to tuck anything back in, it's stayed nice and snug. The chevron strip was more of the same, cut approximately to size and then folded and glued around all of the edges. 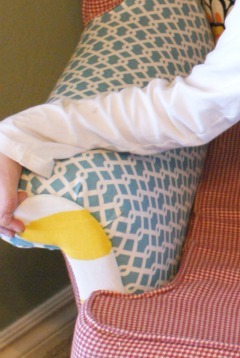 I went back several inches underneath the cushion and glued the rest right along the cording. For the skirt, I roughly doubled the measurement around the chair and hemmed it along the bottom side. Then I sectioned it off, stapling first of all on the corners and the middle of each side. Then I used the loose fabric between staples and eye-balled some pleats, once again right up under the cording. There was a hard surface under this section of the chair, so I did use the staple gun wherever I could get it to go in well. 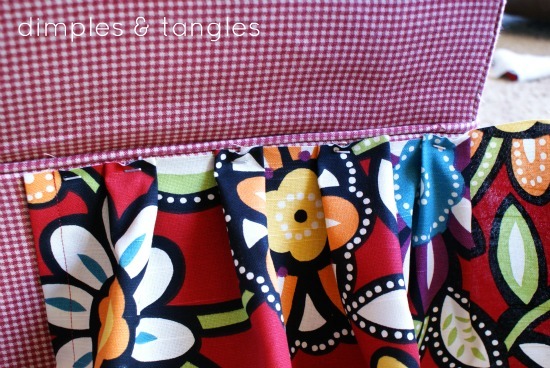 To cover the raw skirt edge I glued on some fringe and ribbon, and a thin strip of black and white ribbon balanced out the other side of the cording. Ta-Da! Wall flower to Flower Power! I think this method really is a good alternative if you have a chair that is in fairly good condition, but just needs a little pepping up. Although it currently has clothes strewn across it, the little one does enjoy sitting here to read from time to time, and I think it's an extra piece of art in the corner! What do you think? Would you try the hot-glue upholstery method? I would never have thought to use the old glue gun if I hadn't read this, Jennifer! I think it's a bonus that you posted your how-to six months later because it's a testimonial to how well the glue has stood up. Such a fun piece for a kid's room - I love your choice of fabrics!! 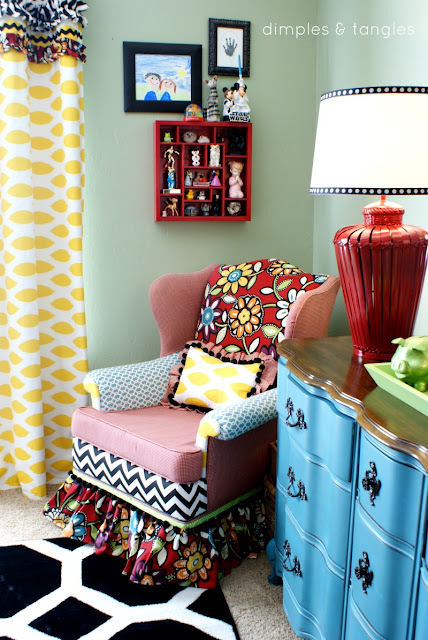 (That yellow ikat dot on the window is great too!) 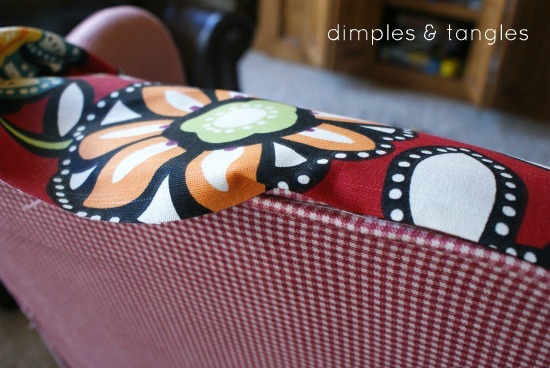 Thanks for sharing your method....I am eyeing a tired old ottoman right this instant!! You are a genius, girl!! I love a shortcut that doesn't look like a shortcut!! It truly is a piece of art with your fun mix of fabrics. You have my wheels turning, again! I absolutely love this chair! I am so glad you posted on this; when I read about your daughters room earlier, I couldn't wait to see how you did this! My daughter would love this, I am sure yours does as well! I'm going to try it on an ottoman! Love that method. I have still been meaning to try it on some pillows after seeing what you did with your friends pillows. Great job! I just love your bold colorful style! I just joined with GFC and can't wait to see more! Such a fun chair! I love your fabric choices! Super cute, fun and creative! 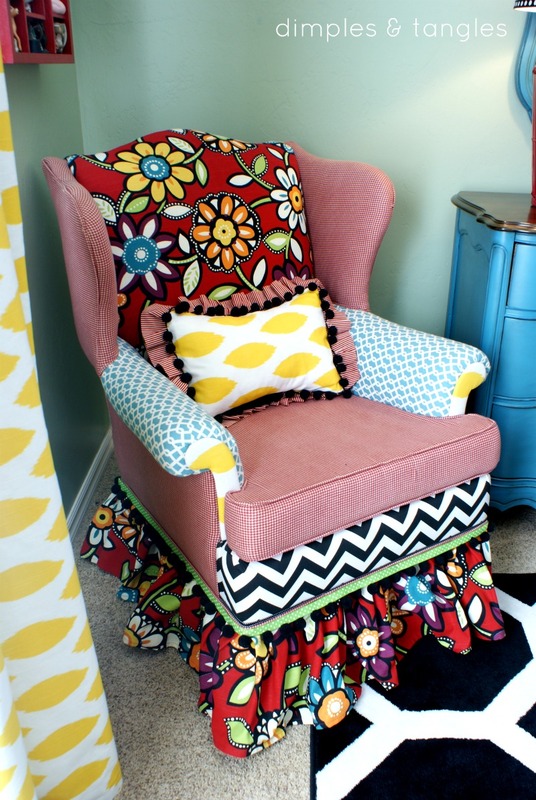 Great idea, I have a couple of chairs that only need the arms redone and I love the patchwork look. Thank you for sharing. Awesome, I can't believe you did it with a glue gun! 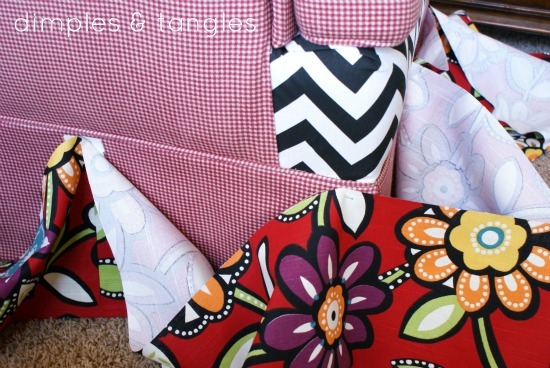 Love the fabric combinations you came up with. Super cute update! o.k. you have inspired me. I have a little red couch that has seen it's better days... I'm going for it! PS: I pinned this to my Awesome Furniture Board...because it is Awesome!! Wow that is amazing!!! The technique and your choice of fabrics. Great job. Impressive and informative!! I'm loving the bold flower pattern!! That is one funky chair. I wish I had one. 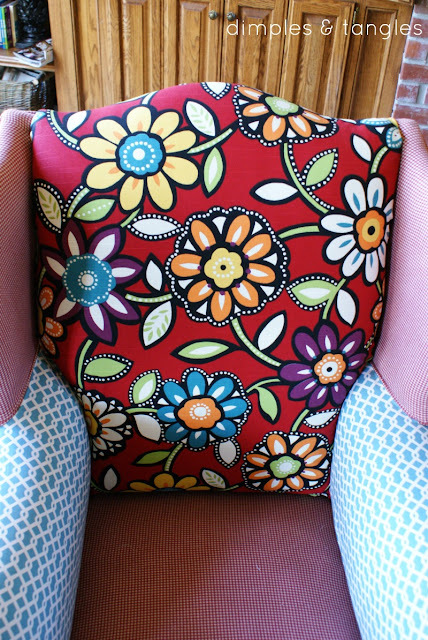 Wow, I will definitely look at upholstered pieces for sale with a different eye! Great job! I love your chair! It looks so fun, you've done a great job with it! 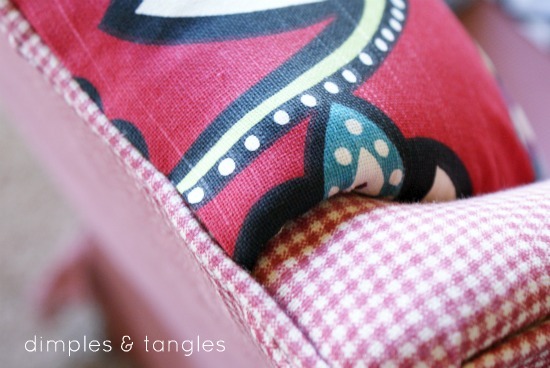 I have this linked to my upholstery DIY post too today, for inspiration! This is just lovely. 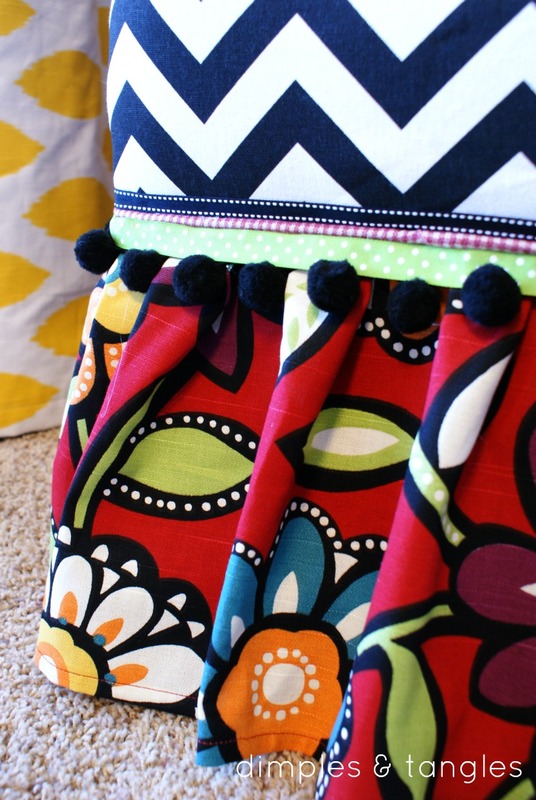 I really like the mix of fabrics you've used. I'd want to sit in there all day if it was my chair! Or, to be honest, if it wasn't! I love your blog - I've signed up to subscribe. I am in awe right now. Seriously, this is such an awesome idea. Pinning it because I know I will use it in the future. 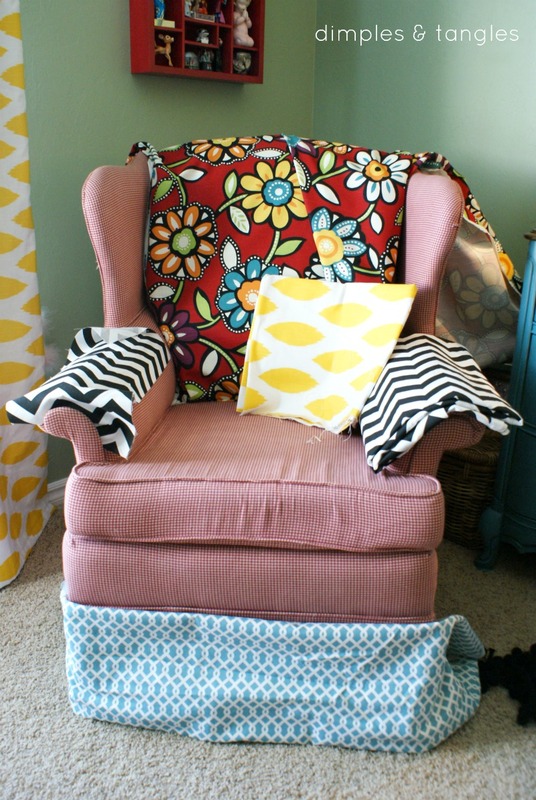 Hannah and I are totally doing this with an old wing back chair I just moved out of my classroom...to her new bedroom. ;) I'll let you know how it goes! 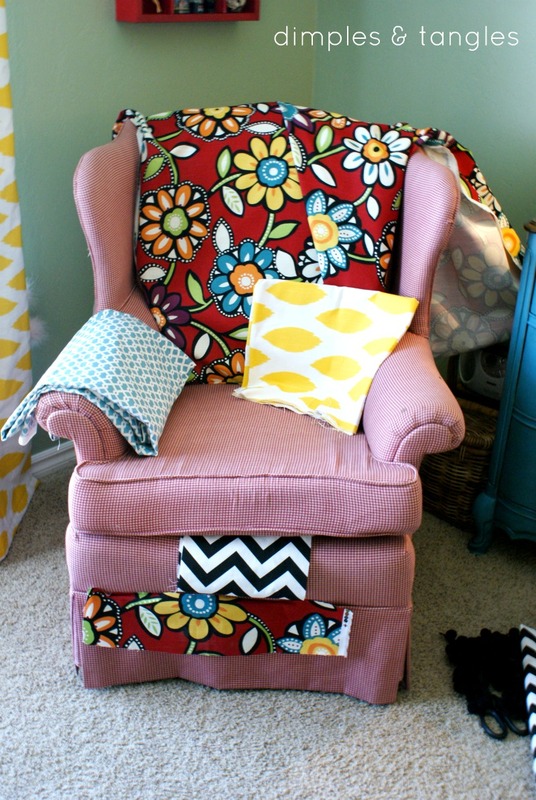 Love love love that you covered that chair using a hot glue gun. I once was the costume designer on a play with 125 different changes and I used a hot glue gun for all of them. I didn't even own a sewing machine at the time. Loves my glue gun!!!! !